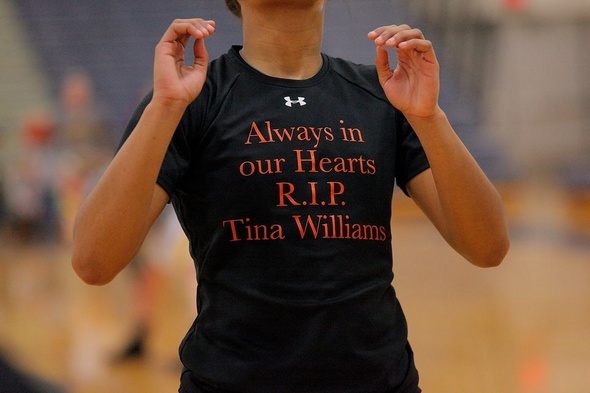 The Huron girls basketball team honors Bianca Williams' mother Tina with their warmup shirts. The Huron High School girls basketball team hasn’t suffered many losses on the court. Off the court has been a different story. Junior guard Bianca Williams’ mother, 39-year-old Tina Williams, died suddenly in November. In her memory, the River Rats (15-5) have “TW” sewn above their hearts on their warmup jackets. Their warmup shirts read “Always in our hearts, R.I.P. Tina Williams." Ypsilanti boys basketball coach Steve Brooks says he often gets players whose egos are befitting of the NBA. So it should come as no surprise the method the team agreed upon for greater accountability. Fines. Yes, fines. Brooks said the players decided amongst themselves to institute a system of fines for violations of team rules. Miss practice? Pay a fine. Cuss during a game or during drills? Pay a fine. Forget your uniform at home? Pay a fine. Brooks isn’t getting rich off this player-instituted fine system. For one, the most a player can be “fined” is $3, and Brooks himself never sees any of it. The Phoenix practice every Saturday morning, and it’s tradition to buy donuts afterward. All of the fine money goes directly toward the donut fund and any left over is put toward the next team dinner. In its 64-51 loss to Skyline Thursday, a second-half run doomed the Pioneer boys basketball team. Two days earlier, in a 64-41 loss to Temperance Bedford, they were outscored 39-19 in the second half. Pioneer beat both teams the first time they played. The consecutive losses dropped Pioneer from contention for the Southeastern Conference Red Division title. Though they started the week alone in first place, Huron and Bedford are now tied with 9-2 league records with Pioneer (8-3) in third place. The Kicking Mules and River Rats will play Tuesday in a game that will determine the division champion. Skyline High School will graduate its first senior class this spring. Earlier this week, the girls basketball team said goodbye the first five seniors in team history. As the game wound down, Wade made it a point to get the four seniors that were able to play (Wint was out of town) on the court together. As they exited the floor, the crowd gave the girls a rousing ovation. Thursday night was an on-court “Pink out” at Manchester High School. During the girls basketball team’s 61-43 win over Grass Lake -- which clinched the team’s first-ever share of a Cascades Conference championship -- money was raised to support the American Cancer Society’s fight against breast cancer. Players donned pink uniforms, a pink ball was and there were pink nets on the baskets. Nearly $700 was raised during the game through silent auctions and donations.